You know how you can “know” something in a cognitive sense, and then something happens that causes you to have a different understanding, a new way of knowing? When that happens, it’s usually because layers of affect and ethos – new forms of understanding and insight — get added through life experience. This happened to me last week, the first time I had ever done what millions of Americans are starting to do as a means to counter police harassment, intimidation and brutality: I made a video recording of a very unpleasant encounter with a police officer. In just seven days since its publication, there have been more than 9,000 views, suggesting that a lot of people are concerned about the quality of performance of our police forces. 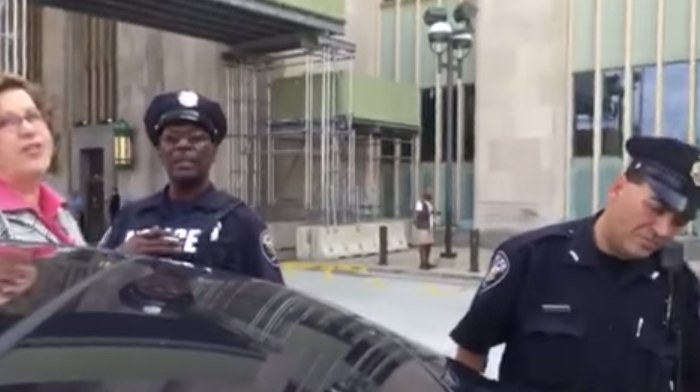 On Wednesday morning, July 1, 2015, at the 30th Street train station in Philadelphia, I had an encounter with a police officer that truly rattled me. It was the first time I have experienced police harassment in twenty years (don’t ask about my jet-lagged and crazy encounter with a Kennedy airport police officer back in the 1980s). I was en route to pick up my colleague Monica Bulger who was arriving that morning from New York City. I had come in to the back side of the station, using that bizarre turnaround approach from the west side of the building. I parked and waited for a bit. When I thought I saw Monica, I drove the car a bit forward – but it was not Monica. So I curved around and parked in an open space where I had a direct view of the station entrance. To make it easier for Monica to spot me, I stood outside in front of my car. This was a large, very angry police officer – a black man– with a gun and no visible identification. I got scared. I handed the phone to Monica, who by then had arrived on the scene, and she continued to record. Then the police officer approached Monica, repeating with increasing loudness, “Can you please turn off the recording device?” He repeated this over and over again. Finally, she turned it off. We were both scared. This was intimidation at its best. After the camera was turned off, he continued to yell at me. I got a little rattled after having been coerced like that, and I raised my voice, too, noting that I had lived in Philadelphia for eight years and that this officer was not behaving like the good cops who protected me in my Philly neighborhood. Why was he overreacting? Almost to prove his power to me, he then spoke the magic words, calling in “a hostile vehicle,” and within seconds, we were surrounded by eight police officers, including K-9 and Homeland Security forces. It was truly bizarre. I asked for his name so that I could make an official complaint. He refused to give it to me. He wrote out the ticket and another officer signed his name to it, explaining to me quite candidly that I could probably fight the ticket in court and win. The police officer had the authority and the power to issue me a parking ticket. But I also had a form of social and economic power fully on display during the encounter, as a wealthy white woman standing besides my expensive late-model Mercedes Benz with my iPhone in hand. Was this a bizarre form of class warfare? I wondered. All this occurred just a few hours before our panel discussion session at the International Society for Technology in Education (ISTE), which was entitled, “State, School, Corporate and Citizen Surveillance: Issues for Educators.” The panel featured Jay Stanley, a senior policy analyst at the American Civil Liberties Union (ACLU), Hector Postigo, Associate Professor of Communication at Temple University, Thomas C. Murray of the Alliance for Excellent Education, and Monica Bulger, research associate at the Data and Society Research Institute. Among other topics, we talked about the new forms of surveillance available to ordinary people, who can use their cell phones as a way to check abuses of power of government. Of course, it is lawful to video record police officers performing their official duties – and check out this helpful resource from the ACLU of Pennsylvania on the topic. But because this law may not be fully respected by police officers, others may experience what I faced: being coerced into consenting to stop recording. This experience changed the way I think about citizen surveillance. According to Jay Stanley, “Photography is a form of power, and people are loath to give up power, including police officers.” Although I had the legal right to make a video recording of a police officer performing his official duties, the intimidation from the police officer was terrifying and it made me question what I knew. That’s why we turned off the camera: the officer used verbal intimidation to deprive me of my right to record the incident. I am now more than ever convinced that education is needed to make sure every American knows the scope of rights and responsibilities under the law. Great post. Something similar happened to me at Washington’s Union Station in 2008. I was simply filming a brief video of my British cousin boarding a train. An overly assertive Amtrak conductor demanded I cease filming. He invoked all sorts of similar bogus arguments that video taping was against the law. My British cousin was absolutely dumbfounded by the demand…especially in the “land of the free.” I now have the link to Amtrak’s photography policy (which is quite permissive, and quite clear) on my phone. That’s a shame that you had to go through that experience over a simple parking error. Did you ever contact Amtrak or Amtrak Police about your experience? ?